Curious to identify the two bicycle business niches which provide winning profitable opportunities? You'll be surprised to see the simple, low cost and rewarding avenues that fit perfectly into most any marketplace. The bicycle business has traditionally been thought of as a retail store selling new bikes with the possibility of have a repair business as a component. This is today, still a viable small business idea. With the increasing awareness of ecology, nearly 40 million Americans have one or more bicycles. The bicycle opportunity is mushrooming. Here are two low cost, potential high earning options. John Frances lives on the western edge of Chicago. As a life-long two wheel enthusiast, he often helped friends repair their bikes. He always had to purchase new parts for these repairs because used or reconditioned parts were generally not available. About four years ago he decided enough was enough. He had this crazy idea; an idea that his friends were lukewarm about. Today they believe he is a genius. Last fall, I interviewed John. What follows is what John shared concerning the key aspects of his success. Keeping operating costs low was John's priority. He emphasized the need for low rent. He looked at several out of the way locations and settled on a 3,200 sq. ft space for $2.15 a sq. ft.; about $575 a month. About four months prior to renting this space John collected used bikes acquired at small cost. He placed ads on Craigslist (free), visited yard sales and placed one column inch ads in his local newspaper that said, "Broken Bikes Wanted" along with his cell number. For about 40 bikes he spent around $390. He felt it was important to disassemble all the bikes, clean each part, make an inventory list and display the parts according to size/kind of bike. By doing this he felt he could charge more, have an appealing space and eliminate any chance of injury, which could occur if his customers worked on the bikes themselves. This reduced is cost for liability insurance. 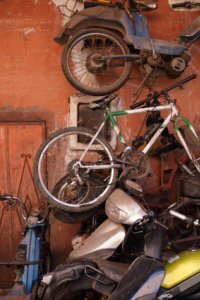 He hooked up with bicycle part distributors to receive their parts catalogs and then stock popular parts that he didn't have. He told me that he knew bicycle repair businesses were highly profitable, so he included bicycle repair in his business plan. He added two more profitable aspects to his company. First, he carried 10 to 14 new bikes (only the most popular) so he could trade-up customers to new bikes. Second, he started teaching bicycle repair. He currently has 4 students (retired gentlemen). In closing my interview, John emphasized three essentials that made his new venture work. First, low rent is a must! Second, his bicycle business is a destination oriented business, That is, people will seek out his services, so he is not dependent on a high traffic location. Third, he felt he needed to offer as many service components as he could to avoid being dependent on a narrow business offering. As part of my mission to Pay It Forward for all the help I received as an entrepreneur, I want to help you as you consider starting any business venture for Free. This is not a come-on or a trick to get you to buy something. This is a sincere offer to assist you. Period. Please, if I my help, just click on my photo above. Cally Gardoski's grandfather Noble loved collecting old (not necessarily antique) bicycles and had 39 of them when he passed away. Living in the middle of nowhere in West Texas, she knew that trying to sell them there was impossible. She poked around on the Internet filling in the subject line with words like old bikes, antique bicycles/parts, rare bicycles/parts, etc. She joined a couple of bicycle forums. All this led her to conclude that the Internet was a way for her to parley her growing interest in old bicycles/parts into a solid opportunity. She decided that she would enter the buy, sell and trade bicycle/parts marketplace. There were few competitors in this niche. She felt she could acquire the bicycle knowledge she would need to be an authority. She dived in. About four months later she was comfortable talking "bicycle shop" lingo in the forums. Now was the time to start her new online company. Just one problem. She had no idea how to create an effective website. Three years later, Cally is beginning to be a big-time player in the trading and selling of old and antique bicycles. Cally's point to me was, "You never know where a rambling imagination can lead." Thank you for visiting Winning Bicycle Business Niches.